All year round storage covers are available in a range of materials that enable the cover to be lightweight and at the same time durable. 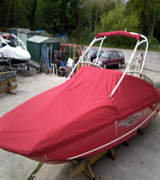 AM Marine Trimming manufacture these covers ensuring that they are easy to use and able to be securely fastened. Due to the fact that these overall covers are made to measure they can be designed to go over existing cockpit frames which enables access to the cockpit areas during the winter months. This proves to be very successful with regards carrying the necessary out of season jobs whilst keeping your vessel protected.